The rooms were excelent, nice bed the food was very good a bit expensive but it's worth the money, the pool was free for all and that was really nice!! The host helped us with advice about where to go to the beach and everything!! Konstantina and her staff were extremely welcoming and friendly. Friendly staff. Clean, light and bright room. Pool was lovely. We liked this place very much! It’s the only one children friendly hotel im this area! The rooms And the pool are clean, the territory is beautiful and the sea is near! The beach is good and almost empty! They were very unfriendly!! They were not nice at all, the bed was very uncomfortable. The apartment is very small. Wonderful and nice staff, cuisine, facilities and position. The property was very well maintained and it was a haven to the surrounding chaos of the area. The owners were friendly and very accommodating. 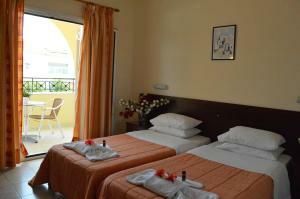 The rooms were comfortable and provided us with all we required. The pool is large and clean and the poolside bar and restaurant give an adequate menu to satisfy ones needs. The room was very clean and the bed comfy. There is a fully equipped kitchen as well. Konstantina speaks English very well and was friendly and helping. There was also a very cute terrace. The pool is big and clean. There is a parking on the site so there is no need to worry about your car. If you are in Kavos you must go to boat trip to Paxos and Antipaxos islands! 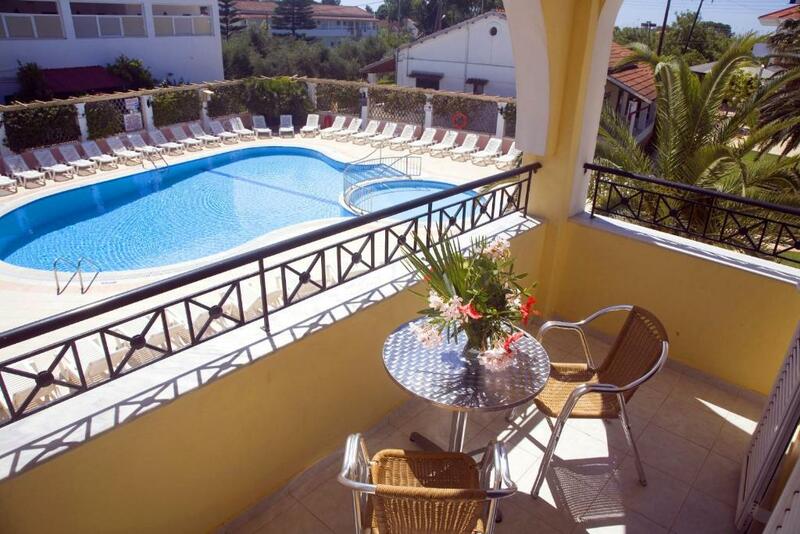 Lock in a great price for Konstantina Apartments – rated 9 by recent guests! One of our top picks in Kavos.This residence consists of one main building with 20 apartments and features a family-run restaurant. 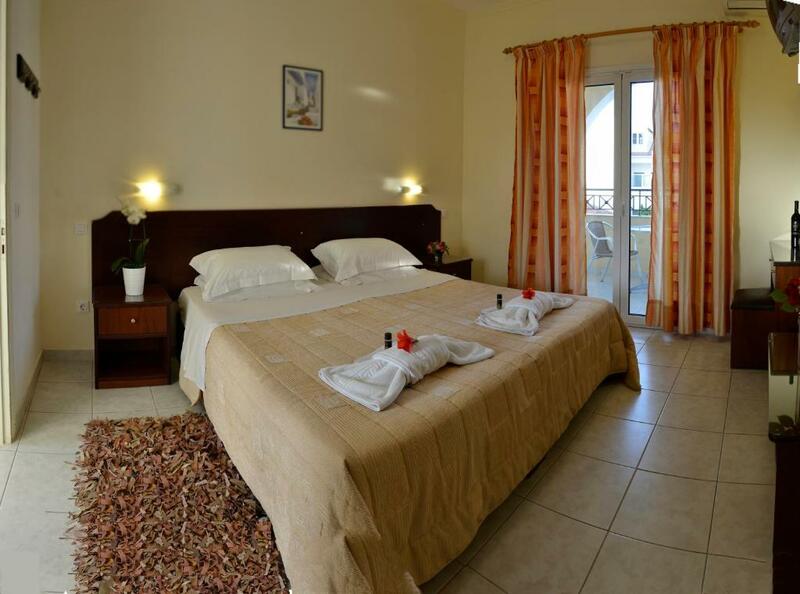 Kavos resort is only 350 feet away from one of the most beautiful stretches of sandy beach on the island of Corfu. One of the highlights of this property is the beautiful garden which features a swimming pool, children’s pool and a pool bar where you can savor Greek breakfast every morning. Built by the grandfather, the resort has been greeting guests from all over the world for the last 25 years. 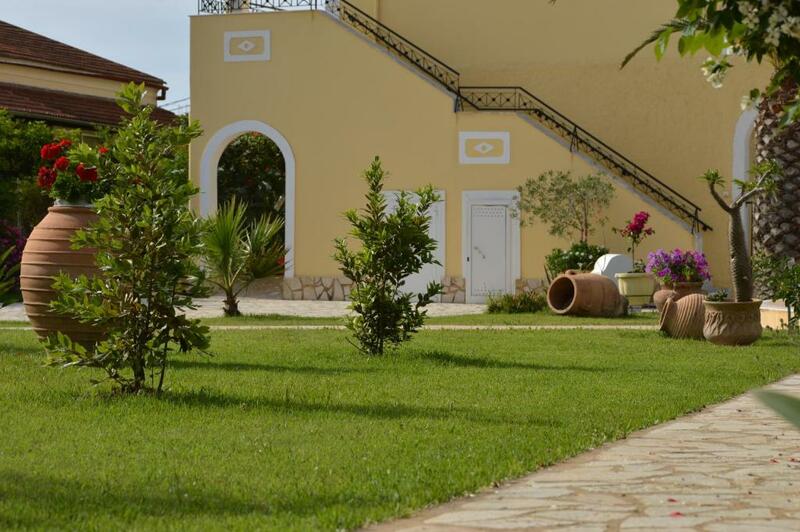 The next generation extended and beautified the resort, and it is now one of the loveliest in the whole of Kavos. Impressed by the family atmosphere, many visitors have become regulars; guests’ well-being is the number one concern. You will immediately feel welcome and at home here. When would you like to stay at Konstantina Apartments? Only 328 feet from the beach, this air-conditioned apartment is fitted with dark wood beds and opens to a balcony. The kitchenette includes a mini fridge, cooking hobs and kettle. A satellite TV is also provided. Please note that a third person can be accommodated in an extra bed. We are a family-run hotel with a long history. It was built by my Dad over 20 years ago and still to this day it stayed in our hands. We take a great care of it with friendly atmosphere and always keen to help you if needed. Our restaurant serves fresh and delicious traditional Greek dishes everyday as well as more common and loved food. 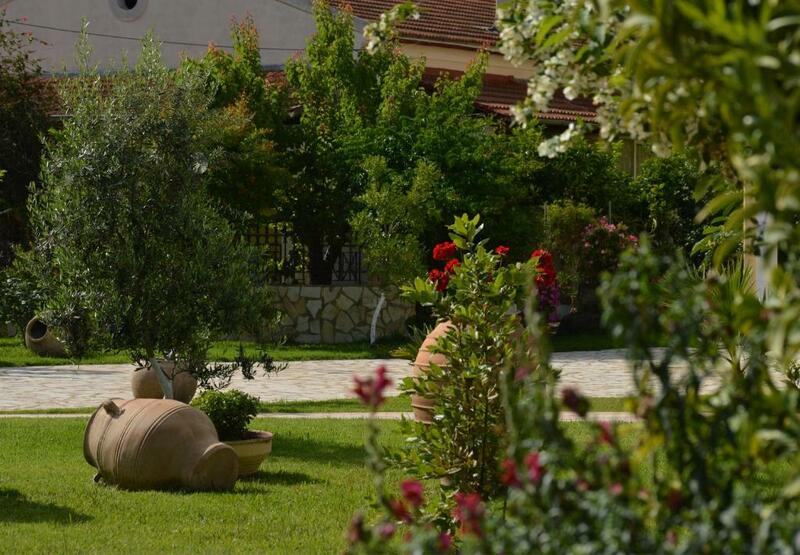 We also grow herbs and vegetables in our garden that we use for cooking. Near our hotel there is a plenty things to do like water sports and boat trips. The nearest beach it is just 5 minutes walk down from us. If you need some souvenirs from Corfu we have couple of shops that sells them here. House Rules Konstantina Apartments takes special requests – add in the next step! Konstantina Apartments accepts these cards and reserves the right to temporarily hold an amount prior to arrival. Please inform Konstantina Apartments of your expected arrival time in advance. You can use the Special Requests box when booking, or contact the property directly using the contact details in your confirmation. Terrace and is close to the beach. kavos is a place for young drunk disco-addicted, not for families. Fortunately the Kostantina apartment are far enough form the cental outdoor mega-disoteque. The location of the hotel was in an area that suits a much younger crowd with far too many bars and noise. Thankfully this hotel was set back from the main street and the crowds and noise did not disturb us. If you like privacy when you take a bath or have bladder needs then our room is not for you! There wasn't a door between the WC and the rest, instead there was a sliding "glass" therefore- no isolation. Even though there is a kitchen with fridge, keep in mind that you are not allowed to bring anything to the pool area. There is a bar from where you can buy stuff, however the prices are quite high. Interestingly enough, we were charged for the same ice cream two different prices. From the off certain members of un-named staff (Alexandra) were acting off with us for no reason, making us, 3 young teenagers feel very unwelcome. Our shower was broken and even when we complained nothing was done and no apology was given. After being, yes agreeably a bit loud, Konstantina and Alexandra came down to our room and screamed at us saying we had to leave in the morning. This left us 3 young teenagers who had limited amounts of money left with nowhere to go as the owner said she was keeping all our money even after we made a HUGE effort to apologise. This is a nasty place and even though there is a huge sign out the front saying ‘Open To Everyone’ young people here to party are not welcome (even though this is Kavos and the accommodation was just off the strip) I genuinely believe for young people this is a money making scam and I don’t recommend this place to anyone. Konstantina and the rest of her family and staff are just wonderful. We felt like we were home and they treated us with such warm, beautiful care. The property is beautiful, George makes the most superb food and Katerina and Allesandra took such good care of us. We were away from home travelling for six weeks and when we arrived in Corfu, Konstantina made us feel so welcome and it truly was the highlight of our holiday for us. Konstantina apartments is beautiful and Konstantina herself, is a truly beautiful person - one in a million and will always have a special place in our hearts. We stayed for two weeks, and had breakfast included. The breakfast itself is OK, but it was hard to eat the same thing every day for two weeks. Amazing people work at this place. Konstantina is always super helpful. Our 2,5 year old was very happy at this place - everyone were playing with him, there is a playground and a swimming pool for kids. The food is very tasty, portions are big and prices are very reasonable. The atmosphere is nice. The city itself is not very interesting, specially if you travel with kids. But we rented a car, and traveled across the island. However, we were really happy coming back to this place every day. Safety box in rooms rather then in reception, balcony to be closed off on ground floors. Maniacs. This is the word that describe perfect the management. A friend of ours (female) come to visit us in the middle of the night and the manager has apare from nowhere to tell us that is forbiden to get visits. Also is forbiden to eat or drink at the pool area anything you don't buy from the pool bar. And they are vigilant .. And of course this bar is most expensive location from Kavos. For example, anywhere in night clubs you can get 2 long drinks for 5 euro. In konstantina's bar one long drink is at least 6 euro. I can understand this in a hotel, but in "apartaments" with kitchen ... The wi-fi is present in any room (a router inside the room) and connection is strong. The problem is that usually the internet NOT WORKING. Work only few mb and stop. Probably is limited ... They pay attention to everything happened in location and this can be a little bit annoying, but i suppose it's the best solution for kavos madness.